Joey has an unnatural attachment to his socks. Frankly, I don’t get it. He likes long, colorful tube socks, pulled all the way up to his knee (even on the hottest day). And once he gets his socks on, he has no desire to take them off – not at night, not even the next day. And so, Joey and I fight “The Sock War” on a daily basis. As the underappreciated ambassador of hygiene in my home, I wrestle with flesh and blood to get Joey to change his socks – because in time, Joey’s socks develop an unnatural attachment to him, and someone has to peel them off before they completely fuse to his sweaty, stinky little feet. It is a daily battle that is not for the faint of heart. Daily battles are not easy, but they are a vital aspect of the Christian life. I was recently talking with a dear friend of mine who is struggling. With tears in her eyes she told me that she fights a specific, soul-crushing battle every day. As we kept talking, she continued to emphasize the unrelenting, day-to-day aspect of her pain – and she said it as if her struggle had no redeeming purpose, no value, no victory. But although I hate to see her hurting, I am convinced that daily battles have immeasurable purpose and value in God’s economy. In Romans 7, the Apostle Paul laments his own daily battle. Fighting sin and temptation was his everyday occupation – not just in the brazenly immoral, Gentile cities where he was called to preach and establish churches, but in the dark recesses of his own God-fearing heart. In Verses 14-23, Paul pulls no punches about his own struggle with sin. And while he never glorifies his sin with too many specifics or colorful war stories, he glorifies God as the only antidote to his sin sickness (Verses 24-25, Mark 2:17, I Timothy 1:15). And in II Corinthians 12:7-10, Paul talks about his non-specific “thorn in the flesh”, more evidence that even this giant of the faith didn’t get a pass from the everyday occupation of fighting his own humanity. And that brings me to the blessed promise of Romans 8. There is no condemnation in having a daily battle – because verses 3-4 tell us that God the Father, God the Son, and God the Holy Spirit are all vested in that battle with us. And though we will struggle, and falter, and even fail at times, real defeat only comes with retreat. Condemnation only comes when we walk away from the battle and allow sin to take up unchecked, unchallenged occupation in our lives (Psalm 37:23-24, Proverbs 24:16). The relentless, daily struggle is proof of life and proof of purpose. Don’t be afraid of the struggle, because it tells you that your conscience is still alive, that the Holy Spirit is still wooing you and striving with you, and groaning for God’s mercy on your behalf (Romans 8:26-27). And God’s endgame is revealed in the promise of Romans 8:28, as God works the good and the bad together into something that ultimately glorifies Him. Satan will tell you that your daily battle is a sign of hopelessness, but God is with those who engage and fight the good fight (Isaiah 54:17-18, Joshua 1:8, Ephesians 6:10-18, Philippians 2:13, I Timothy 6:12). Dear warrior, I know you are tired (Psalm 144:1-2, Isaiah 40:31). I know your battle is endless, but praise God that His love endures forever, His mercies are new every morning, and He fights for you (Exodus 14:14, Psalm 100:5, 118:1, Lamentations 3:21-23). The endlessness of your battle is a good sign. It is the daily dependency that God wants from you – the kind of dependency that lives on the just-enough-for-today manna of God’s strength and not the stored-up provisions of self-reliance (Deuteronomy 8:3, Luke 11:3). Embrace the daily battle, because you will find God on that battlefield (John 16:33, I Corinthians 16:13, II Timothy 2:3, 4:7-8, I Peter 5:8-9, Jude 1:3). And finding Him is half the battle. Is there a daily battle that you need to be fighting? Have you allowed some sin to take up permanent residence in your life? 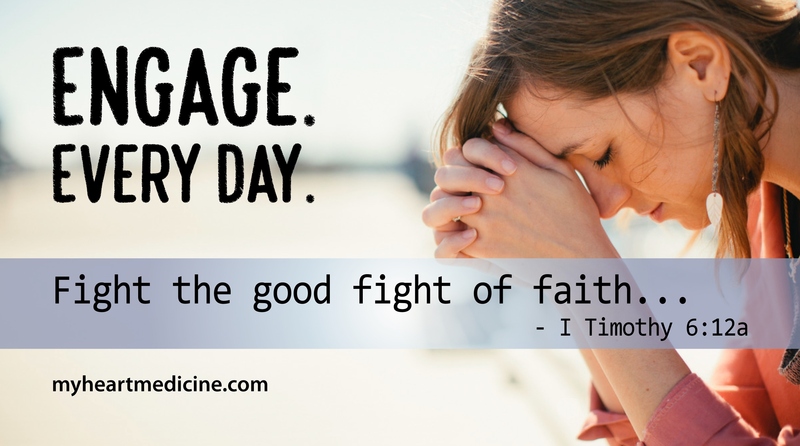 If so, let me challenge you to take up the fight and engage with God’s help. Any battle that grows your attachment to Him is a battle worth fighting.